Sadako Sasaki, a survivor of the Hiroshima atomic bombing, made this red origami crane while dying of leukemia. This holiday season, CNN highlights inspiring acts of kindness and generosity in a special series called "Giving in Focus: The 12 Days of Goodness." (CNN) -- When Sadako Sasaki lay in her hospital bed sick with leukemia, she showed her father origami cranes from local school girls. "When you fold 1,000 paper cranes, you will get well," her dad responded. Sadako was just 12. Hoping to get better, she began folding tiny origami cranes, using paper from get-well gifts and wrappers from medicine. She had survived the atomic bombing of Hiroshima on August 6, 1945. Yet 10 years later, her fragile body suffered the effects of exposure to radiation. "Please treasure the life that is given to you," Sadako said before her death on October 25, 1955. "It is my belief that my small paper crane will enable you to understand other people's feelings, as if they are your own." Sadako's death inspired a memorial in Japan's Hiroshima Peace Park, complete with a statue of her holding a golden crane. Now, one of her last origami cranes resides in a new memorial thousands of miles away, in the country that dropped the bomb. It was given to the Tribute WTC Visitor Center in New York by her aging brother. "I thought if Sadako's crane is placed at Ground Zero, it will be very meaningful," says Masahiro Sasaki, in an education program produced by the tribute center and the Japan Society. "Commonly, in Japan, the crane is regarded as a symbol of peace. But for us, in the Sasaki family, it is the embodiment of Sadako's life, and it is filled with her wish and hope." "I hope by talking about that small wish for peace, the small ripple will become bigger and bigger." The delicate red crane, smaller than a fingernail, is on display at the center. Hanging near it are origami cranes that were placed on the fence around Ground Zero after the September 11, 2001, terrorist attacks. Another 10,000 cranes from families and colleagues of Japanese victims of 9/11 surround Sadako's. Every time I visit the World Trade Center site, I wonder where my son was and where he suffered. "This little girl believed that the world could be made better if we all worked together," says Lee Ielpi, the co-founder of the center, whose grown son, Jonathan, was killed on September 11. "It sends that beautiful message: Even in death, we're going to carry on that little girl's wish. ... I'm so tickled we can carry on her wish." Meriam Lobel, the center's curator, says staffers were speechless when Masahiro Sasaki presented the gift. "He lifted it out with this little, tiny tweezer and there was this beautiful red glistening crane," Lobel says. "It was like a gem, like a little red ruby." For Tsugio Ito, the symbolism of the crane holds special meaning. "When the atomic bomb was dropped, I was exercising in the schoolyard at the elementary school. My brother was a student at the high school," he says in the center's educational program. He survived. His brother was killed in the bombing. Fast forward six decades. Ito's son was working for Fuji Bank in the South Tower of the World Trade Center on September 11. Kazushige Ito, 35, was one of 24 Japanese killed on 9/11. "After September 11, we waited for him to call. One month passed, then two months, then I came to accept that perhaps this means he is gone," he told the center. "Every time I visit the World Trade Center site, I wonder where my son was and where he suffered." What happened that day only reinforces "how important it is to have peace." "We must have peace," Ito says. "I feel that stronger now than ever before." Tom Johnson has been active on the board of the Lower Manhattan Development Corporation ever since 9/11 when terrorists killed 2,976 people. His 26-year-old son, Scott, was among the victims. 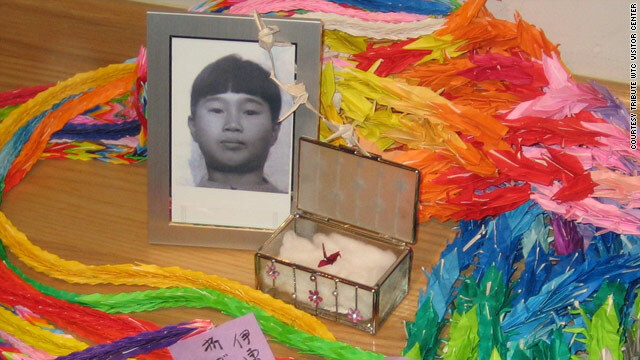 When he visits the center, he cherishes two items in particular: his son's death certificate, which lists "homicide" as his cause of death, and Sadako's origami crane. "You have to derive some kind of message of meaning that will make the world heal," he says. Sadako's brother says the spirit of his sister lives on in the crane, "because she had a heart of kindness." He had five of her original cranes. He hopes to give the others away to museums on other continents. "As a victim of war or a victim of terrorism, we share the same grief, and share the sense of duty to tell the stories to our children and our children's children," he says. "Although the incidents were different, I hope we can help each other work for world peace from now on."